Our History | Wellington Chapel | A Bible-believing evangelical church in the village of Wellington, near Hereford and Leominster. Christians have met at Wellington Chapel since the early 1800′s. The work began when a Mr Thomas Day began a ‘Sunday school’ in nearby Pear Tree Cottage. This school provided an opportunity to learn the Bible and to learn how to read and write. It was not long before the chapel was built, originally called ‘the room’, to accommodate the thriving work. This building was later extended upwards and backwards so that a kitchen and upstairs schoolroom could be added. Thomas Day continued to be the leader at the Chapel until his death in 1869. There is a plaque in the building commemorating his 50 years of service in the village. His son, also Thomas, took over the leadership until his death one Sunday evening in 1902. 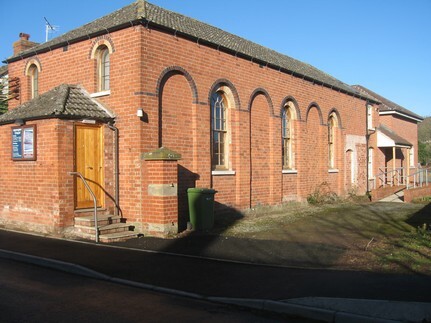 During these years and throughout the 20th century, Wellington Chapel played an influential part in village life through its Sunday School and regular services. Following the death of Thomas Day in 1902 the work continued under the guidance of several godly men, especially the caretakers who lived at Chapel house next door. Towards the end of the 20th century the congregation had declined to the point that only a handful met together each Sunday. They continued to meet faithfully looking to God for the future. December 2000 was a sad month for this small congregation. During the preparation for a Sunday service a large hole was found in the floor. The building was forced to close through the excessive dry rot that was found in the wood work. It was unsafe to hold any meetings and the chapel would lie dormant for a further five years. Nevertheless, the work of God is not in buildings but in people and the fellowship did not die when the doors of the chapel were closed. God was faithful and the meetings continued in the local school and then moved back to the chapel site with the provision of a portakabin. During 2004 Mark and Sharon Roberts, with their young family joined the chapel and in the Summer the congregation began to look at calling a pastor to lead the work forward. Paul Kosciecha was appointed and by the summer of 2005 the church had more than trebled in size. That Summer, work began on refurbishing the old chapel building and this was ready for the Christmas carol service when it was re-opened to the glory of God. After Paul Kosciecha left in 2008 Peter Seccombe took on the leading of the work on a temporary basis while the chapel looked for a Pastor. In 2010 a double story extension to the church was completed, financed by the selling of some of its land and the generous giving of members of the congregation and other friends. From December 2011 until April 2016 Ed McMillen was called to be the Pastor. The history at Wellington Chapel is a great testimony to God’s faithfulness in how he has worked and provided for its needs. We look to him to continue to build up his church in the future by making wholehearted followers of Jesus. We are looking forward to our new pastor Kristian Dimond with his wife Carla and their 5 children coming to us in the spring of 2019.